Description: Move in ready! All brick beauty with countless upgrades, including kitchen, all baths and hardwood flooring throughout first level. New carpet upstairs. Outstanding corner lot with backyard oasis of mature trees. Walk to shopping, restaurants, and health club, yet enjoy a private, serene setting (no commercial views) and private side street. 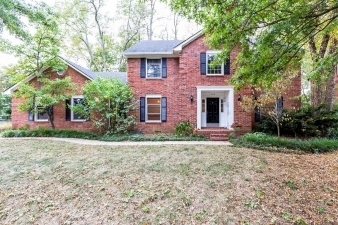 Just minutes to airport, keeneland and schools. Huge side entry with two-and-a-half car (648 sq. Ft.) Garage with room for two cars plus a bay for storage and area for workbench. Pull-down stairs to attic. Four bedrooms, including huge master bedroom with beautiful master bath and two walk-in closets. Additional bedroom has walk-in closet. Kitchen has open layout with stainless steel appliances, granite countertops, top-of-the line cabinetry, two pantries. Family room has brick fireplace, built-in bookcases. Formal dining room. Updated led lighting. Data believed correct but not guaranteed. Buyer to verify prior to offer. Agents read agent remarks.